On November 7th and 8th, Scottsdale Fashion Square played host to the inaugural AzCentral Food & Wine Experience. The event boasted numerous renowned chefs including Top Chef host Graham Elliot, six James Beard Award winners, exclusive dinners, demos and of course food! 70 restaurants served 130,000+ bite sized samples. 27,000 drink samples from 200 wine, 30 craft beer and 70 spirits varieties were also served. 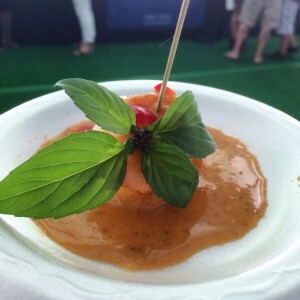 Guests were treated to 40 different chef demonstrations at the 5 different stages throughout the event. 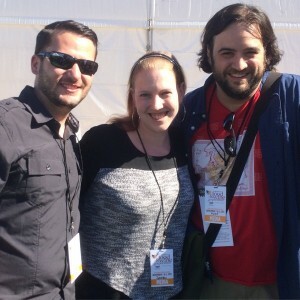 Our first day at the AzCentral Food & Wine Experience was spent at the Blogger Journey. 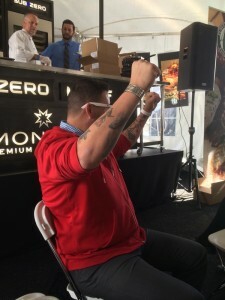 Local bloggers were treated to special program in which we were able to meet some of the high profile guests, including Top Chef host Graham Elliot, in a more intimate setting. 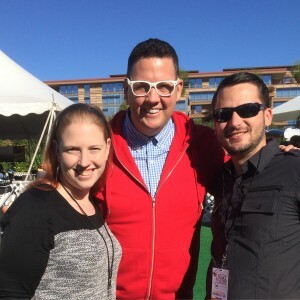 Our itinerary started with a Q & A with Graham Elliot (but not before a few of us danced to a little Jackson 5 and Outkast with him). We discussed everything from Top Chef, tattoos, and even the upcoming Star Wars movies. A piece of advice he offered for home cooks was to adequately season your meal throughout the cooking process. He pointed out that on Top Chef, the judges have never told a contestant that they over seasoned a meal. Next we met with Wine “Jedi” Kristin Brott, the Moet Hennessey Wine Ambassador. We tried several wines including Chandon Rosé and Newton Unfiltered Cabernet Sauvignon. We got to geek out a bit and discuss some of the technology behind the grape sorting. She explained that they use machines that scan the grapes checking for specific parameters that the winemakers wish to utilize for that type of wine. From wine we moved to whisk(e)y and were treated to priority seating for a panel featuring Dr. Tom Turner, the Master of Whisk(e)y. We tried various types of whisk(e)y from bourbon to scotch. 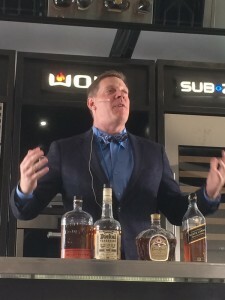 The world of whisk(e)y is quite similar to wine in that while the types are similar, there is enough difference that there is something for everyone. After all the great beverages, we took a break from food and drinks and met the new Arizona Republic and AzCentral Dining Critic, Dominic Armato. After a mass Twitter follow exchange and dining discussion, he told all the food bloggers to keep doing what they are doing because the food world needs us. You will never meet a more awesome and down to earth guy! Our last scheduled meet and greet was with Crockpot Guru Jen Bare of Get Crocked. It was great to meet someone who started as your run of the mill food blogger and found great success. Keep your eyes open because there will be great things coming from her in the near future! The day ended with a cooking demo by Graham Elliot, who prepared his take on buffalo chicken. If this recipe was any indication of the others in his cookbook, they are all going to be pure gold! Day 2 was full of great food and drinks! We bumped into several chefs including Stephen Jones, Beau MacMillan, Aaron May, and Robert McGrath. We tried a ton of incredible food including butternut squash soup from Crepe Bar, goat pot roast from Top of the Rock, and braised pork from Larder and Delta. If this was only the inaugural AzCentral Food and Wine Experience, we’re sure that this event is just going to continue getting better and better. Between the top notch food, amazing demos and fantastic specialty experiences, this is an event worth checking out every year! Next → Next post: Devoured Culinary Classic Tickets Have Sold Out!